Gleaning: It's a term used when a farmer goes out to the field to reap what's left over from harvest. But for one D.C. nonprofit, it means so much more. WASHINGTON -Gleaning: It’s a term used when a farmer goes out to the field to reap what’s left over from harvest. But for Miriam’s Kitchen — a D.C.-based nonprofit that feeds the homeless — gleaning means a solution for providing restaurant-quality meals to those who need it most. Miriam’s Kitchen feeds approximately 300 people each day — 175 for breakfast and 125 for dinner — and all at the operating cost of $1 per person. 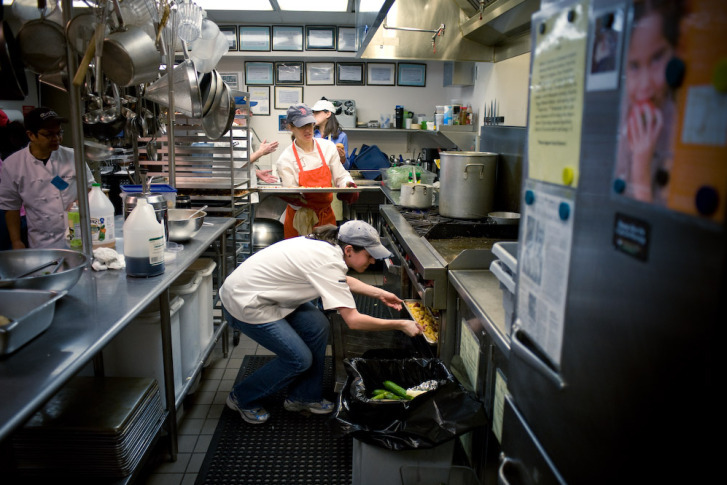 But despite its seemingly impossible budget, the chefs at Miriam’s Kitchen churn out incredible meals, many of which are made with local ingredients that are donated, or gleaned, from the FRESHFARM Foggy Bottom Farmers Market. “We’ll open up the fridge and we’ll pull out a whole basket of produce that we got from gleaning,” says Steve Badt, senior director of meals and volunteer engagement. Badt has been at Miriam’s Kitchen for 12 years, and has benefitted from the gleaning program through FRESHFARM Markets for eight years. He estimates last year’s donation from the farmers — which could be anything from produce, to meats and cheeses — was between $20,000 and $30,000. Badt’s frittatas are just one example of the restaurant-quality meals the chefs and volunteers at Miriam’s Kitchen serve. Breakfast might also include hash browns, stone-ground grits and fruit. And dinner? Think squash, bison lasagna, kale salad and apple pie. “The only way we can stick to that budget and also have that quality is with the donations,” Badt says. But these tempting meals are just a vehicle for the staff at Miriam’s Kitchen. Badt and his team use the home-cooked food as a way to encourage the homeless to come inside. Once the guests sit down and are fed, a Miriam’s Kitchen case management services staff member talks to the guests and begins to connect them to the services they might need — all with the overarching goal to end chronic homelessness. “When you start your day off with a great meal and end your day with a great meal, don’t you feel better? And that’s what it’s all about,” Badt says. Ann Yonkers, co-executive director of FRESHFARM Markets, says because of the amazing meals cooked and served, the guests at Miriam’s Kitchen have come to recognize and expect a certain level of quality in the meals. “We’re changing palates because people really are tasting fresh food and because (the chefs) are cooking beautifully,” Yonkers says. And Miriam’s Kitchen is just one of eight nonprofits gleaning from the area’s FRESHFARM Farmers Markets. To keep programs, such as the gleaning, up and running, FRESHFARM Markets, a nonprofit, itself, is hosting one of its largest fundraising events on Monday, Nov. 11. And the focus of the event is the core of the organization’s mission: to feature food from local farmers. Farmland Feast, now in its 11th year, is bigger than ever before. In 2002, it began with 75 guests in a D.C. restaurant. This year, FRESHFARM expects more than 400 people, and it will be held at the Ritz-Carlton Hotel. This year, Farmland Feast is offering something a bit different to cater to a younger crowd. Prior to the four- course dinner prepared by 15 applauded D.C. chefs, FRESHFARM Markets will hold a cocktail party from 6 p.m. to 8 p.m.
During this two-hour window, three of the area’s best mixologists — Derek Brown, Adam Bernbach and Gina Chersevani — will mix cocktails using local ingredients, and seven of the 15 dinner chefs will serve up small bites, along with oysters. Guests of the full dinner experience will indulge in more than six local area wines, poured by 13 D.C. sommeliers, as well as a wide-range of food options. “Everything from clams and oysters to bison,” says Yonkers, who adds that the meal will end with dessert: locally made chocolates and digestifs, or drinks infused with herbs. “These are designed for after eating well. You have a sip of one of these digestives and you feel great right away and then you feel OK in the morning,” she says. Yonkers explains that Farmland Feast, which also has a large auction component, helps to bring in about 25 percent of all funds raised each year. And these funds directly support the farmers and D.C.’s local food movement. This year, Badt is speaking at Farmland Feast, on behalf of Miriam’s Kitchen, to bring awareness to the other organizations that benefit from having relationships with the farmers and FRESHFARM Markets. “We couldn’t do what we do at Miriam’s Kitchen without the produce that’s donated from the farmers,” he says.